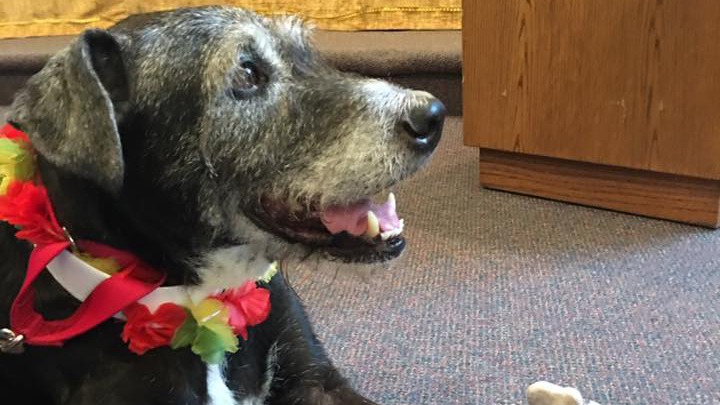 Wili, a terrier mix, received a cancer diagnosis in November and was given as little as three months to live, but Miller’s beloved dog has hung on much longer with the help of surgery, chemotherapy and a healthier diet. Miller, rector at Christ Episcopal Church in Covington, Louisiana, decided to take time off this summer to spend quality time with Wili while he could, and they embarked on the road trip together on July 1. Their six-state tour featured events in 18 cities, including visits to churches, breweries and bookstores, where part of the proceeds of sales of Miller’s two books were added to the daily fundraisers. The duo made their final stop July 16 at Mountain View Presbyterian Church in Las Vegas. Miller delivered a sermon at two morning services and then spoke at a gathering hosted at the church in the evening. That one stop raised $3,500 for the Animal Foundation of Las Vegas, Miller said on his Facebook page, and the tour’s final fundraising total reached $12,150. He estimated the round trip will add about 5,000 miles to their Honda CRV by the time they get back to Covington, and after all the public events on the way to Las Vegas, the ride home will just be about spending precious time with Wili. Compassionate and caring priest for this precious creature of God’s creation. Fr Miller sets an example of compassion for non-human beings that all of us should embrace. Praise God! If dogs aren’t in heaven I ain’t going! Agreed. It wouldn’t be Heaven without dogs.